We, the G.T.E.V. (Gebirgs Trachten Erhaltungs Verein) D’Lustigen Isartaler are a 501(c)3 tax-exempt non-profit organization (club) created to promote, and foster among its members a genuine love for Bavarian & Austrian traditions, customs, folk dancing, singing and camaraderie, and to uphold and display original authentic Bavarian Tracht (regional clothing); and to support other German & Austrian organizations in their effort to do the same. 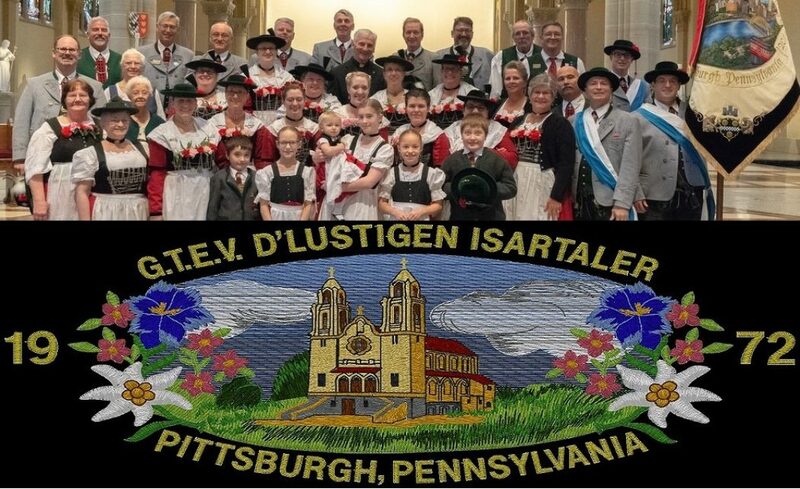 We have been an active club doing this in Pittsburgh since 1972, which began at Saint Anthony’s (German) Catholic Church in Millvale, North Hills, and officially incorporating in 1975. Now over 40 years later, we have members from all over Pittsburgh and the surrounding area. Most of our club members are of Germanic descent: either they themselves or their parents, grandparents, great-grandparents are/were from Germany, Austria-Hungary, or Switzerland. Some members are of all Germanic descent or only part, but everyone enjoys the customs and culture that our club offers, and wish to be a part of it and help us promote and preserve it. We have had many cultural events (dinner-dance) with great German Bands and performances with our dance and chorus groups: Oktoberfeste, Stiftungsfeste, Fasching Heimatfeste, Sommerfeste, Frühlingsfeste, Maifeste, Gedenkgottesdiensten, Sankt Martinsfeste, und Trachten Wallfahrten, and have represented the Germans at the Pittsburgh Folk Festival for the greater part of 35 years. Currently, we have only 4 meetings for our General Membership a year in, which are usually on a Monday evening in: March, May, late August and late Oktober. All of our members have authentic Bavarian/Austrian Tracht (regional dress) to wear at all of our events and other German/Austrian functions. Our Kindergruppe consists of any child of a current adult member. We accept children of all ages to take part in our Kindergruppe. Children beginning in Kindergarten through middle school are welcome to join the Kinder dance group (High school members dance with the adults). We strive to pass on our customs to these Kindergruppe members so they can enjoy their heritage throughout their lifetime. Our Kindergruppe primarily learns how to dance in the Bavarian/Austrian tradition, along with some language skills. True to the good old traditions! All members pay our nominal dues & support our group by attending our meetings and events, as well as own original Trachten clothing, especially our Verein uniform. Members are also encouraged to help take part in promoting our events.